I was in Cuba for a family trip in July, four days in Havana at the start of a sixteen day road trip to the south coast and the Bay of Pigs and back. 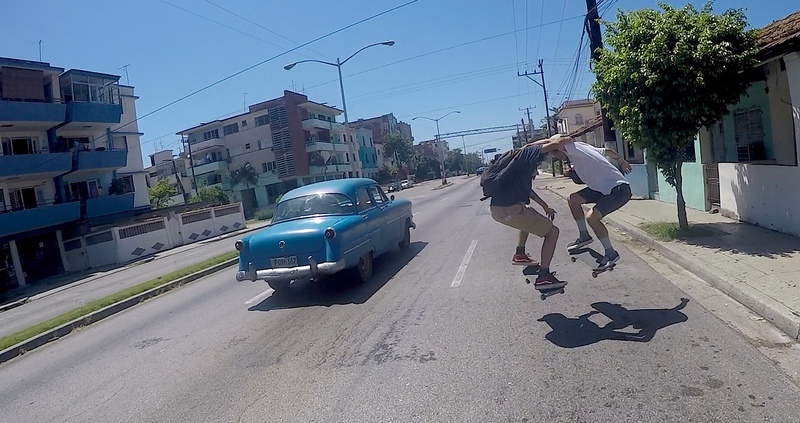 I first heard about Cuba Skate a few weeks before the trip. I had watched the Vice video with Andrew Reynolds, Lucien Clarke and Ishod Wair called “Exploring Cuba’s skate culture”. The team are met at the airport by the local skaters and Miles Jackson who is the founder and director of Cuba Skate. As a student on an exchange to Havana Miles discovered the local skate scene and fell in love with it. 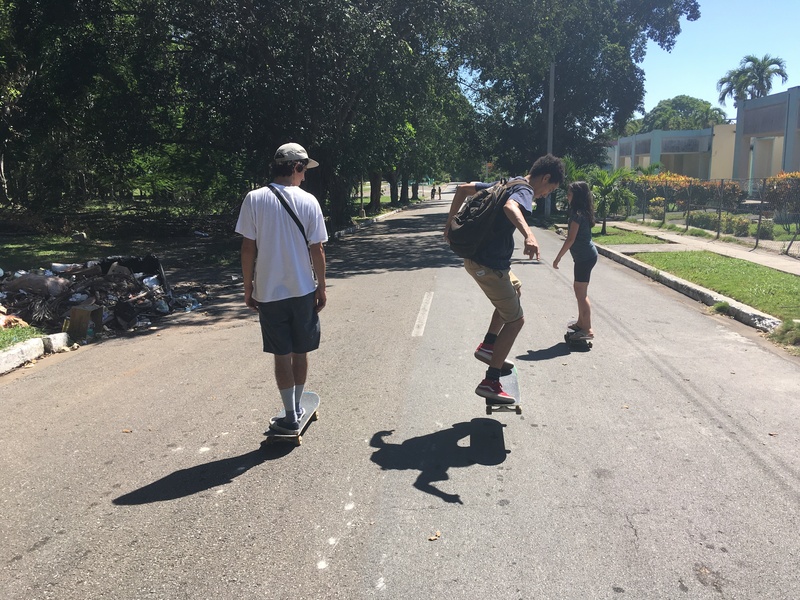 He quickly became aware of the Cuban skaters passion and also the difficulties they faced skateboarding on the island. He set up Cuba Skate to assist the skaters by helping to bring in much needed equipment, to renovate local skateparks and also to promote and encourage self sufficiency within the scene. The problems the skaters face can seem insurmountable: no skateshops or distribution of equipment, heavy taxes and import duties on goods,the ongoing trade embargo enforced by the U.S. and little or no access to materials to make their own equipment. We arrived by taxi at a quiet street in Nueva Vedado not quite knowing if we were at the right house. A kind looking old lady answered the door and asked us to wait out on the porch so Ione and I sat on the rocking chairs wondering still if we were in the right spot. 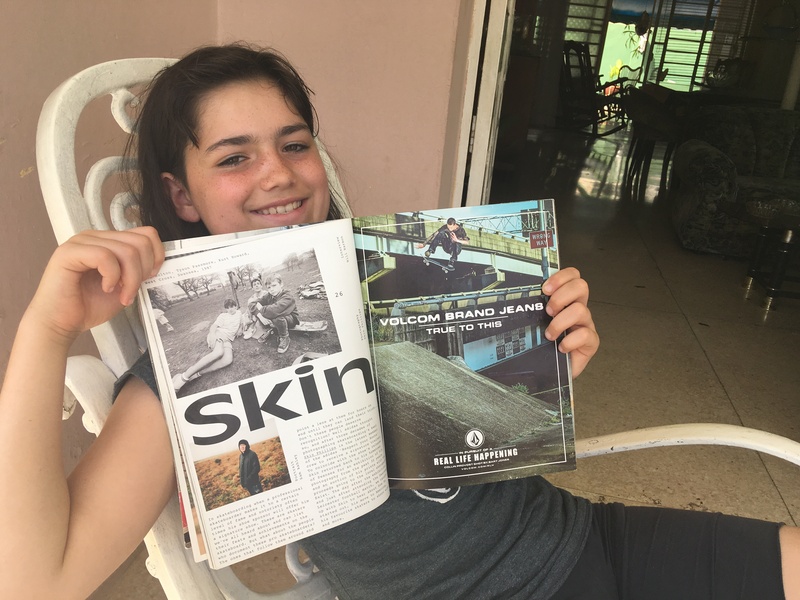 Ten minutes later she came back out with a handful of skate magazines so it seemed we had found Cuba Skate. The funny thing was one of the magazines was the issue of Free skate mag with the Skin Phillips article and all the pictures of the Swansea scene from the 80′s and the weekend in Swansea when I drove the Adidas team van from Heathrow to Gower and back……I didn’t try and explain this in my limited Spanish. 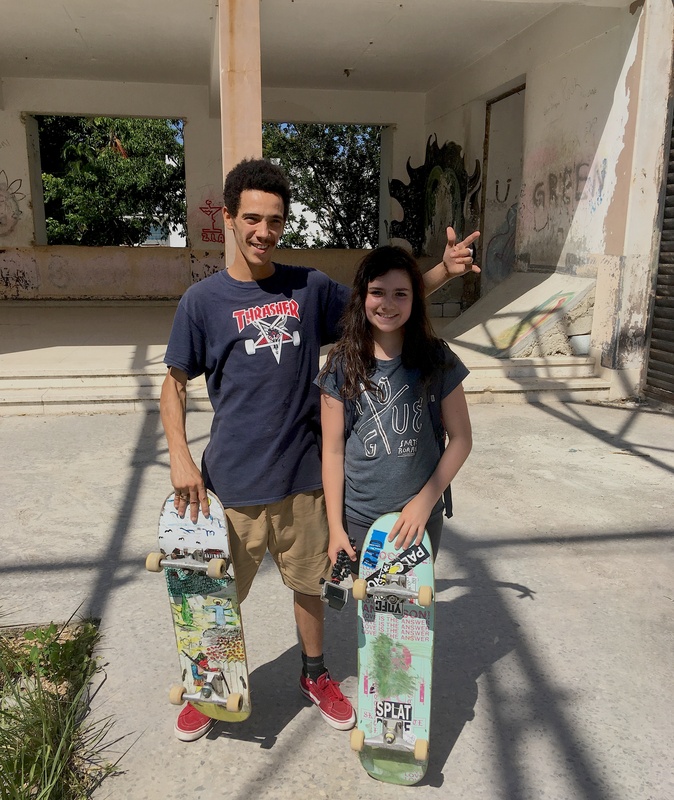 As I was on a family trip I decided rather than trying to skate and hopefully meet some locals to show us around I would sign Ione and I up for the Day in the life of Cuba Skate which they run through Airbnb experiences. This gives you direct access to the skaters and as you pay for the experience it also gave me a chance to donate some money and get a great insight into Cuba Skate at the same time. Our hosts and guides were Orly and Ari who were keen to share their story and listen to ours. After spending the first part of the day at the house putting designs on broken boards, cutting them out and sanding them down, drinking coffee, eating amazing fresh mango and talking about life in Cuba we headed off to the DIY skatepark at Ciudad Libertad. The skatepark is built in a derelict gym at an old army base and is a great mix of transition with a bowled out room and plenty of ledge and bank obstacles. The floor is amazingly smooth and is almost marble so everything is fast. Cuba Skate are doing an amazing job under challenging conditions. Check out all the links, visit them if you are in Havana and make sure you take as much equipment as you can carry to leave on the island, old or new it all helps skaters skate! Thanks Orly, Ari and Cuba Skate for making us feel so welcome. The skate scene in Cuba is one of a kind so take a look and get inspired.